Iranian President Mahmoud Ahmadinejad on Friday denounced Israel and said that "The very existence of the Zionist regime is an insult to humanity." In the speech which was broadcast live on Iranian TV in honor of al-Quds Day Ahmadinejad added that "The western powers cannot tolerate criticism of the Zionist regime. They feel compelled to defend it." He also warned: "It is dangerous if even10% of the territory is given to the Zionists." 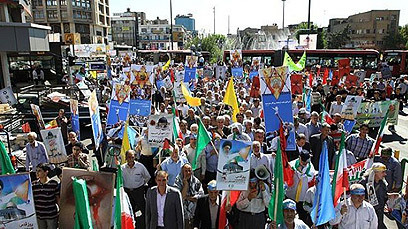 Massive rallies commenced in Tehran and throughout the Islamic Republic to mark al-Quds Day in support of the "Palestinian resistance to the Israeli regime." Demonstrators waved Palestinian flags and held signs bearing slogans such as "Down with the US" and "Death to Israel" at the rallies the Fars New Agency reported. Hezbollah flags were also waved during the rallies alongside pictures of Iranian leaders Khamenei and Khomeini. "The Zionist regime is a malignant cancer, if even one cell remains on Palestinian land, the current situation will continue in the future," the president said and warned: "Zionists want to spread." Ahmadinejad added that al-Quds Day is the day of unity among all human beings to remove the "Zionist black stain" from the human society," Iran's PressTV reported. “Today, countering the Zionist entity and the fabricated Zionist regime safeguards rights of all human beings, defends human dignity and paves the way to save humankind from arrogance, poverty and misery,” Ahmadinejad said in his address. He added that "Zionist presence on even one centimeter of Palestinian land was dangerous. That's my personal understanding. Don't blame me later, this is how I see things." Thus, he believes that even the two-state solution was a "historic opportunity for Zionists, it will mean hundreds of years of efforts go down the drain." Addressing worshippers at Tehran University Ahmadinejad also alluded to the recent changes political changes in Egypt and warned the Arab nations against joining with the west, "which has exchanged one mask for another and become their friend." He recommended that "our enemies must not be forgotten and we cannot let them control the region." The Islamic Republic's president went on to say that western powers were "thirsty for bloodshed," and he claims that they have managed to cause a conflict within the Islamic world between Shiites and Sunnis. He suggested that "for your own good, set the Zionists aside and focus on nations' rights, seek recognition of your interests. You must know that a new spring will come if you do not heed my advice. Stop supporting the Zionist regime, they are useless to you." The president called on the region's nations to wake up: "You are interested in a new Middle East, so are we, a new Middle East will come into being but with the help of God, the new Middle East will have no memory of the presence of the Americans and Zionists." He then asked: "Stop insulting the Iranian nation, you need to be friends of the Iranian people, it is for your own good." Al-Quds Day was established by Ayatollah Khomeini 1979 to support the Palestinian struggle and is marked every year on the last Friday of Ramadan. See all talkbacks "Ahmadinejad: 'Black stain' of Zionism must be removed "